New data from the Framingham Heart Study finds that low LDL-cholesterol is related to the future development of cancer. Scientists studied 201 participants with cancer who were matched with 201 controls who were cancer free. The researchers looked at the trend of LDL-cholesterol for an extended period of time prior to cancer diagnosis, using data taken at four points over an average of 18.7 years prior to diagnosis. They found that LDL-cholesterol levels were lower in the participants with cancer than their matched controls at each of the data points. This is another, in an ever-growing number of studies showing an association between low cholesterol (including LDL-cholesterol) and cancer development. The AMA and most cardiologists have been beating the drum claiming that we need to lower cholesterol levels down to numbers only obtainable through the use of medications such as statin drugs. However, they don’t inform the public that there is a risk to lowering cholesterol levels. One risk is developing cancer. Another risk is poor immune system function since cholesterol helps the cells maintain their integrity. Also, lowering cholesterol to miniscule levels will worsen toxicity symptoms as cholesterol helps to buffer toxicities in the body. One of the highest levels of cholesterol in the body is in the brain. It doesn’t take a rocket scientist to predict that lowered cholesterol levels would be associated with brain disorders. In fact, lowered cholesterol levels (and LDL-cholesterol levels) have been associated with the development of neurological disorders such as Parkinson’s and Alzheimer’s disease. Cholesterol-lowering medications are overused. There is no known benefit of these medications in the elderly as lowered cholesterol levels predict a shorter lifespan in this population. If you have not had a stroke or a heart attack, there is no known benefit of a statin drug. Women have never been shown to benefit from taking a statin drug. The only benefit that statins have been shown to provide is for patients who have already suffered a cardiac event—patients who have previously had a heart attack or a stroke. In this case, the research shows a slight reduction in non-fatal heart attacks (approximately 1%) after three years of use. 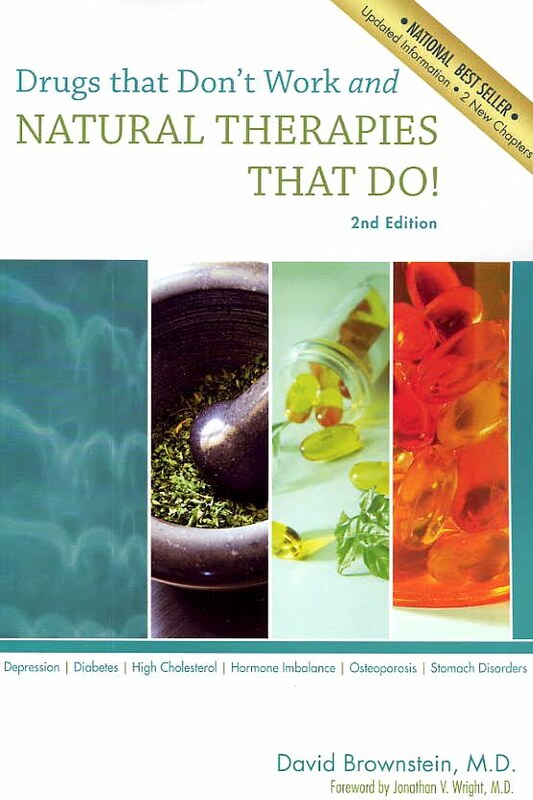 More information about statins can be found in my book, Drugs That Don’t Work and Natural Therapies That Do. Educate yourself about how these drugs work. When you do, you will see that the use of statin drugs does not make biochemical sense. Furthermore, the research behind statin drugs does not make common sense. If you have high cholesterol levels, search for the underlying cause and treat it. That is a common sense approach to a medical problem. I am pleased to announce the release of my newest book, Vitamin B12 for Health. I wish I could tell you that I learned about the wonders of vitamin B12 in medical school. Unfortunately, vitamin B12 therapy was derided by nearly all of my professors. They claimed there was no scientific evidence to support the use of vitamin B12 unless a severe deficiency was found on laboratory testing. I can assure you that my training on vitamin B12 was nearly 100% wrong (ok, maybe 99%). Vitamin B12 for Health was written to educate both patients and health care providers about the benefits of vitamin B12. Vitamin B12 is truly a unique and essential nutrient as we cannot survive without it. Twenty years of clinical practice has clearly shown me the benefits of B12 therapy. This book describes how vitamin B12 deficiency can be the underlying cause of many common illnesses including: anemia, brain fog, bursitis, depression, fatigue, fibromyalgia, and heart disease. Vitamin B12 deficiency is occurring in epidemic numbers. I will also show you the fallacy of B12 testing. For the vast majority of patients, B12 laboratory tests do not correlate with the clinical picture. I have found a therapeutic trial of vitamin B12 can make miraculous health changes. Vitamin B12 for Health should be read by all who are searching for safe and effective natural therapies. This book is now available at: www.drbrownstein.com. Don't Let the FDA Get Away With It! The FDA wants to take away our right to purchase nutritional supplements. They have proposed draconian recommendations on supplement manufacturers that would essentially remove most supplements from being available to consumers. Why would the FDA try to do this? One would hope that they must be doing this to protect us from the danger of vitamins and mineral neutraceuticals. How many people are taking neutraceuticals in the U.S.? It is estimated that 69% of U.S. adults take nutritional supplements with multivitamins being the most popular form. That means that nearly 215,000,000 Americans are taking nutritional supplements. I can assure you that the vast majority are taking these supplements on their own—without the advice of their doctor or without being monitored by anyone. If, as the FDA states, vitamins and minerals are so dangerous, one would assume that many people must be dying from their ‘unauthorized’ use. However, there is no data showing that neutraceuticals are a danger. The latest (2010) statistics available from the U.S. National Poison Data System (http://www.aapcc.org/dnn/NPDS/AnnualReports/tabid/125/Default.aspx) show zero deaths due to multivitamins as well as individual vitamin supplements. Contrast this with report after report detailing the toxicity of FDA-approved prescription medications. FDA-approved Cox-2 inhibitors Vioxx and Celebrex are responsible for over 50,000 deaths and 100,000 strokes and heart attacks. That is one single class of medications. There are estimates that adverse drug reactions (the drug was taken and prescribed appropriately) that resulted in death are the second or third most common cause of death in the U.S.
Perhaps the FDA should focus its energy on what is truly harming patients; the toxicity of prescription medications. Most medications (Cox-2 inhibitors included) work by poisoning enzymes and blocking receptors in the body. As I stated in my book, Drugs that Don’t Work and Natural Therapies That Do, you can’t expect a good long-term result by relying on therapies (i.e, prescription drugs) that poison enzymes or block receptors. There are far too many patients taking far too many toxic prescription medications. What can you do? Number one, don’t let the FDA take away your right to use nutritional supplements. Contact the FDA (1-888-463-6332) and tell them how you feel. Next, take the basic steps to provide your body with the proper balance of natural items it needs to optimally function. That means eating a healthy diet, exercising, and ensuring that you don’t have nutritional deficiencies. The best way to accomplish this is to work with a health care practitioner who is knowledgeable about how to use a holistic approach to promote health. The article points out that if a product contains mercurous chloride, calomel, mercuric, mercurio, or mercury it is wise to stop using the product. Now, I have nothing bad to say about this update. Mercury should be avoided at all costs as it is the second most toxic item known to mankind. What irritates me about the FDA’s update is there was no mention about the danger of mercury fillings. Mercury fillings, the dark material that dentists use to fill cavities, contain 50% mercury by weight. The American Dental Association (ADA) has stated that mercury fillings are perfectly safe. The ADA is very wrong. Mercury fillings are poisonous and should never be placed in any living being’s mouth. If the FDA was looking out for us, they would ban the use of mercury fillings. There should be a class-action lawsuit against the ADA for its defense of mercury fillings. I have treated many patients for mercury toxicity. It is the most common toxicity that I see. What can you do? Avoid all sources of mercury. This includes refusing mercury fillings and vaccines preserved with mercury (such as the flu vaccine). Also, it is wise to limit your intake of fish as all fish is contaminated with mercury. It is best to avoid high mercury-containing fish such as white tuna and swordfish. To help the body excrete mercury it is important to take vitamin C (3-5,000mg/day) and alpha lipoic acid (300mg twice per day). Other ways to aid the body’s detoxification pathways can be found in my books and newsletter. The FDA added two new warnings to statin drugs this week. These warnings include an increased risk of diabetes and mental confusion among statin users. The FDA report said that all statin labeling must carry warnings about increased risk of elevated blood sugar and transient memory loss and cognitive problems. Since their inception, there have been reports of mental confusion and cognitive problems with statin drugs. This should be no surprise to anyone who studies how statins work in the body. In fact, I have written extensively about the side effects of statins in my book, Drugs That Don’t Work and Natural Therapies That Do. Statins are a class of medications that poison the enzyme HMG-CoA reductase. This enzyme is important for facilitating cholesterol as well as CoQ10 production. The majority of the brain is made up of cholesterol. It does not take a rocket scientist or a doctor to predict that cholesterol-lowering medications will cause brain dysfunction. Due to their mechanism of action, statins are bound to cause a decline in brain function. I have seen many patients who take statin drugs and consequently suffer with memory loss, forgetfulness, anxiety, and other brain problems. I counsel these patients to stop taking statin drugs and begin natural therapies to help the brain recover. Millions of Americans are suffering from diabetes. If statins increase the risk of diabetes, perhaps they should be not be given to overweight patients or any other patients at risk for diabetes. Statins cause a myriad of side effects because they poison a crucial enzyme in the body. Remember, you can’t poison a crucial enzyme for the long-term and expect a good result. The FDA warnings were long overdue. I suggest educating yourself about how statins operate in the body. If it makes sense to you to poison a crucial enzyme, then consider using it. A better course is to search for safe and effective natural therapies that help to support the body. More information about these therapies can be found in my books and newsletters.